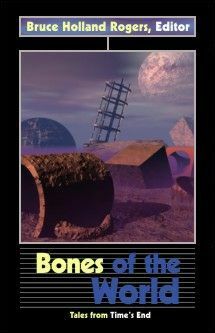 This was my first professional sale, and I will always be grateful to Bruce Holland Rogers for giving me my first big break.This story was written expressly for this anthology, whose theme was “tales from the end of time, when the universe is running down.” I started out with the idea of explorers at the very edge of the universe, where space itself grows thin. But as I worked on the story I started thinking what those explorers would be like, what human beings would have evolved into, so far in the future. By the time I was done, the story was entirely about them and what they had become — the original idea had vanished completely. Like their bodies, the minds of these people are a seamless blend of natural and artificial intelligence; they call their AI “intuition.” They feed on “zeren,” or zero-point energy, a form of energy inherent in the structure of space itself. Zero-point energy is a real phenomenon, but in reality there’s no way to extract very much energy from it. I have taken the liberty of assuming that these people’s bodies are very efficient. Finally a field of zeren appeared at the edges of perception. It was small, and thin, but it was here and it was what they needed. They spread over it eagerly, reveling in the zeren’s sweetness. Gunai was too tired to protest when Enaji channeled some of the energy he’d gathered to her; too tired to compliment Teda when she did the same for Old John. They were all too tired, too hungry, to notice the wolves that circled the field. They came knifing in from the dark of space, three hard black needles that cut through the tribe with inhuman screams. They lacked intelligence and intuition, but their natural abilities and instincts had been honed by eons of competition with the humans who had copied their bodies, and their hunger was sharp. The first took Rael, piercing her through the center and carrying her away in one piece. Her cries were cut short before she was out of range. The second came at Gunai, but she dodged and lost only a few percent of her mass to the wolf’s raking fields. The third hit Teda. Hit her hard, tearing away a huge part of her substance. She pinweeled, screaming in agony, fields and mass spewing into the vacuum. The shock of the impact ran through Gunai, hurting her more than the injury she herself had just suffered. She hurried to Teda’s side, shielding her from the wind with her body, soothing her with strokes and healing energies. Teda’s screams became whimpers, then began to fade. “Here they come again!” cried Enaji.